Editor’s Note: In the middle of the nineteenth century, Kansas was one of several territories that were hotbeds for abolitionist activities and it was during this time that Kansas was admitted into the Union of United States as a free state. With this designation came the right of both black and white students to be admitted to its state supported colleges. Therefore, it is not surprising that Sherman Harvey became one of the earliest baseball integrators of a predominately all-white college in 1888 at Kansas University. Years later, two African-Americans, also with deep roots in Kansas, were early integrators in the coaching ranks of college baseball. This is the first of two interviews with these coaches. The Black College Legends and Pioneers Committee of the National College Baseball Hall of Fame Foundation is committed to educating the baseball world about the accomplishments of historic and current HBCU programs and their student athletes. Our Committee is also committed to investigating and reporting on the growth and proliferation of black legends and pioneers who struck out on their own to integrate traditionally white institutions as ball players and coaches. One such individual, Sonny Maynard, a Kansas coaching legend at his beloved Johnson County Community College (JCCC), recently sat down to discuss his long career in baseball. Coach Maynard began his baseball and basketball playing career in his hometown of Cushing, Oklahoma. After high school, he was recruited to Cowley County Community College in Arkansas City, Kansas. At Cowley County Maynard become a two-time All American (1955-56, 1956-57) in basketball. He graduated from Cowley County and continued up the road to complete his collegiate career at Southwestern College in Winfield, Kansas. There, Sonny Maynard earned a bachelor degree and all-regional honors. After graduating, Maynard lamented that he found it difficult to find a job. His teammates were finding teaching and other jobs. Yet, he found no opportunities at that time. Coach Maynard then recounted meeting Willie Eldridge, who managed a summer semipro baseball team in Arkansas City. Eldridge was the manager of a National Baseball Congress team, May Builders, for which Maynard pitched and played centerfield. Midway through the season Eldridge got “tanked up” one night and went to the team owner’s home and asked for money. The owner became quite angry with Eldridge for his stunt and fired him the next day. The owner, a gentleman named May, then turned to Sonny Maynard to manage the team, but Maynard initially had no desire. Mr. May had already hired Maynard part-time at his construction company. May eventually talked Sonny Maynard into managing, even though Maynard wanted only to play. Having so few opportunities to coach at that time, he moved forward as manager, though his players weren’t happy. The team composition was almost equally half black and half white, with one Indian and one Mexican and they really liked the previous coach. Nonetheless, Sonny Maynard, reluctantly went ahead and managed the May Builders baseball and basketball teams. It was a position that lasted ten years starting in 1957 until 1967. In his first season, the May Builders participated in the prestigious National Baseball Congress (NBC) tournament in Wichita, Kansas and finished a very respectable third place. During his time as manager and coach of the May Builders teams, Sonny Maynard accepted a position in 1958 as recreation director at the Winfield State Hospital and Training Center in Winfield, Kansas. It was a position he held until 1969. While there, Maynard came to the realization that his feelings of discrimination paled in comparison to seeing those individuals who were “more unfortunate than himself” and it reminded him that he had far less to complain about. It was one of the great revelations and educations in his life. Maynard saw that working at the state hospital with the disabled and disadvantaged gave him the conviction to continue seeking opportunities in the field of coaching despite any feelings he had of being discriminated against. In 1969, Sonny Maynard was given the chance to coach on the collegiate level when he was named head coach of the startup baseball program at Johnson County Community College. However, prior to his arrival at Overland Park, Kansas and its Johnson County Community College, Maynard was coveted by Oklahoma’s Langston University as its mens basketball coach, for which he was offered $6500 per year. He was so anxious to become a full-time head coach, Sonny Maynard signed a contract with then president William Henri Hale. As fate would have it, President Hale was fired soon after the agreement and the contract was voided. Later that year, Maynard was given an opportunity to interview at and was hired by Booker T. Washington High School in Tulsa, Oklahoma as its boys’ basketball coach. But then within a week, the athletic director at Cowley County Community College, Orville Gregory was hired as Johnson County’s first athletic director. Gregory quickly contacted Sonny Maynard offering him the opportunity to assistant with men’s basketball and to head the new baseball program at the fledgling institution. Oliver Gregory was very familiar with Maynard as Gregory had previously hired Maynard as the assistant baseball coach in 1967. Incidentally, his hiring at Cowley made him the school’s first African American coaching hire. 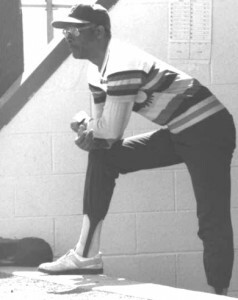 At Johnson County Community College, Coach Sonny Maynard led the Cavaliers to 504 career victories in 14 seasons and three Junior College World Series appearances in 1974, 1980 and 1984. In five of those 14 seasons, Maynard led JCCC to 40 or more wins. Nineteen of his players were drafted by professional baseball teams and in 1980, Coach Maynard was selected by the United States Baseball Federation as one of the coaches for the Japan-USA All Star Series. Even more importantly to Sonny Maynard, he might have been one of the earliest black head coaches of traditionally white junior college baseball programs in the country. Ironically, friend and colleague, Dave Baker became one of the earliest NCAA Division I black coaches of a traditionally white baseball programs when he was named head baseball coach at Creighton University in 1972. Sonny Maynard is a classic, in the mold of the great Eddie Robinson and John “Buck” O’Neil… all three, gentlemen first and great coaches next. Each exhibited grace and high moral values. Coach Maynard is still beloved in Overland Park, KS and especially at Johnson County Community College. Maynard is a member of five halls of fame in this region. Sonny Maynard was first inducted into the 1992 JCCC Hall of Fame class as an administrator and coach. Next, he was inducted into the 1999 class of hall of fame inductees at Southwestern. Then Maynard was inducted into the HOF Class of 2000 at Cowley County Community. Maynard is also a HOF inductee in each of the Conoco AAU (Oklahoma) and Missouri Valley AAU Halls of Fame.